On July 4th, burgers sizzle on the grill, and cold drinks are passed around. Happy dogs play with frisbees, and sunburned kids finally climb out of the pool. In the growing darkness, fireworks begin to crackle and zoom overhead. At last a special song starts playing, and all the people get quiet as they remember the reason for the celebration. When the American colonists declared independence from Great Britain on July 4, 1776, they were doing a very brave thing. They knew that there would be no easy way to make the words they put on paper real. The Continental Army would have to fight for the country's right to exist. You can read more about Independence Day with books from this holiday list. People made up new songs, often using old tunes, and sung them in the streets of America. These were full of pride and jokes about the British. There were lots of them! Some, like Yankee Doodle, are classics we still remember, and many songs told the war news, such as An American Frigate,* that tells the tale of one of John Paul Jones' battles on the sea. When the British returned for the War of 1812, they captured Washington, D.C. and burned the Capitol Building. They then marched to Baltimore. An American lawyer named Francis Scott Key was on board a ship in the Baltimore Harbor during the battle. He was so moved by the American victory that he wrote a song, The Star-Spangled Banner, which became our national anthem in 1931. Through the years, many songs have been written about America - whether for the armed forces or the people at home enjoying their liberty. 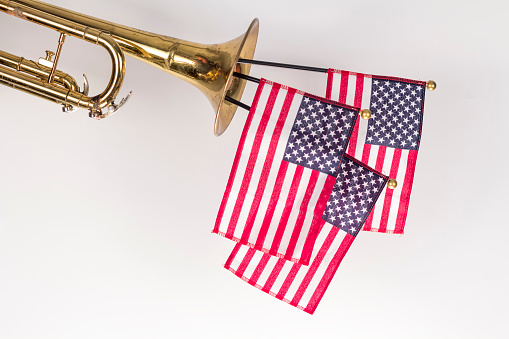 Grab a songbook or a compact disc from the library to celebrate the Fourth of July the way the patriots did: with lots of great American music. Throughout our nation's history, patriotic songs have lifted our spirits during hard times and brought us closer to our heritage and to each other. Behind these "songs sung red, white, and blue" are unforgettable stories that will enrich your appreciation of their unique power. It's hard to imagine a single American who hasn't been touched deeply at one time or another by the songs in these pages. From the soaring chorus of "God Bless America" to the quiet poetry of "America the Beautiful," historian Ace Collins takes you inside the creation of thirty-two classic songs spanning two centuries. Military anthems like "The Marine's Hymn" and "Anchors Aweigh" share pages with other songs of war, such as the War of 1812's "The Star-Spangled Banner" and the Civil War's "Battle Hymn of the Republic." Popular tunes dating back to the earliest days of our nation, such as "Yankee Doodle," are included alongside contemporary hits like "God Bless the U.S.A." Other favorites like "This Land Is Your Land" and "This Is My Country" reflect on our nation in times of peace. You'll meet a surprising and diverse cast of behind-the-scenes characters, which includes both everyday Americans -- teachers, preachers, and soldiers -- as well as celebrated songwriters like Irving Berlin and George M. Cohan. Here are songs that are as close to our hearts as any ever written -- songs that form a rousing soundtrack to America's story. Panda bear (:13) -- Drowsy Maggie (:54) -- Royal American medley (5:25) -- Captain O'Kain/Rover Reform'd (1:13) -- O'Farrell's (4:48) -- Two sided show (11:39) -- Songs of war (5:28) -- Paddy O'Rafferty (:46) -- Baroquasaurus (1:36) -- The boys of Bluehill (:49) -- Spirit of America 1995 (11:32). Francis Scott Key wrote what became our national anthem while being held on board a British ship in Baltimore's harbor during the War of 1812. Peter Spier's drawings recreate the triumph and sacrifice of America. Music for piano and guitar is included. Try it as a read-aloud on patriotic holidays. Follow little Yankee Doodle as he rides through history accompanied by his puppy. Includes music to the song and explanations of old words.